The Disney Renaissance that had begun with "The Little Mermaid" had produced a number of huge hits and enabled Walt Disney Feature Animation to keep pace with Pixar, DreamWorks, Amblin' and the other stiff competition in the increasingly crowded animated feature field. "Tarzan" (1999), directed by Chris Buck and Kevin Lima, was the final triumph of the Renaissance, earning $448 million to turn a tidy profit despite "Tarzan"'s record $130 million budget. If one looked closely enough, though, the signs of trouble were brewing. Instead of tackling classical fairy tales and original interpretations of more recent novels, Disney movies were sliding into a pit of unoriginality. After the criticism it had taken from various pressure groups for "Pocahontas" (though not necessarily as a result), Disney plotted out its next three movies as straightforward adaptations of safe material that had been done to death in other venues: "The Hunchback of Notre Dame," "Hercules" and now "Tarzan." 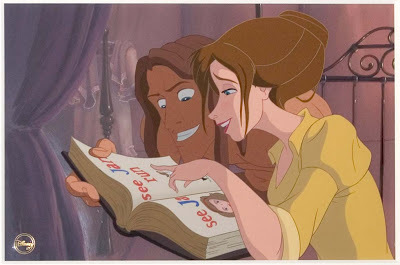 Gone were the days when Disney story people could leisurely pick out appropriate novels and turn them into a "The Fox and the Hound" or a "Lady and the Tramp," stories that had not been done before. The pressure of cranking out a major new animated Disney movie every year was straining the entire Disney team, and what resulted was this string of technically superb but creatively banal features. The momentum of the Disney Renaissance retained just enough momentum to enable "Tarzan" to do well, but the failure of these films to advance the art of storytelling (there certainly were many technical advances) caused later audiences to look at the coming crop of similar films such as "Atlantis: The Lost Empire" with just a tad more skepticism. A 19th century English couple is stranded in the African jungle after fleeing their burning ship. They build a treehouse to care for their infant son, but are killed by villainous leopard Sabor. A female gorilla whose own son recently died, Kala, hears the infant's cries and takes him away before Sabor can kill him, too. 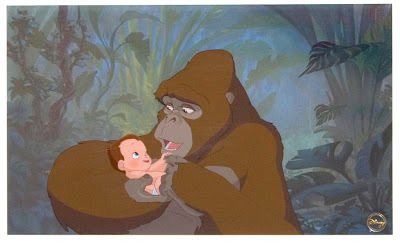 Kala brings him home and raises him despite the disapproval of her mate, Kerchak. Kala names him Tarzan. Tarzan is not as physically gifted as the other animals, so he has to continually work on becoming stronger and more adept with the tools at his disposal. He tracks Sabor down and kills her (or him - it really isn't clear) with a spear, protecting the other animals and causing Kerchak to like him. A small party of explorers from England arrives, and Jane, the daughter of Professor Porter, gets chased by a pack of baboons. 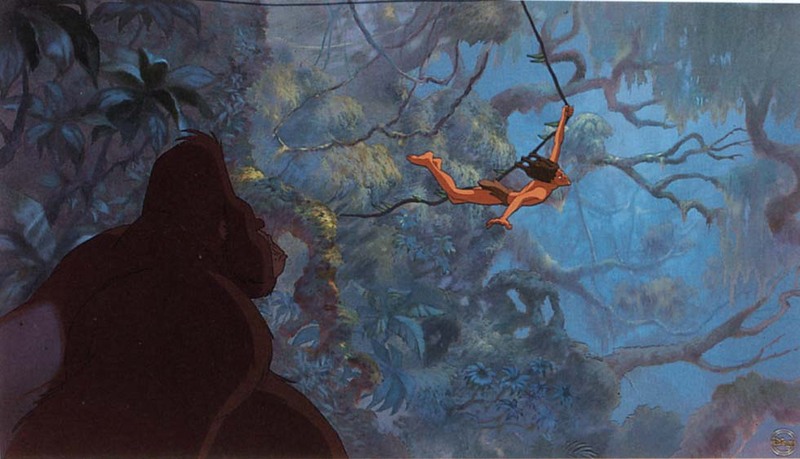 Tarzan saves her, and in gratitude, Jane brings him back to meet her father and their guide, Clayton. 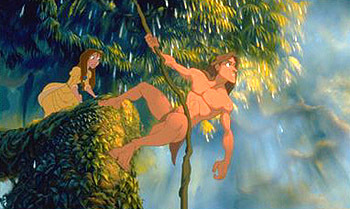 Tarzan learns from Porter and the others to speak English and basic facts about the world, and he and Jane fall in love. Tarzan, however, refuses to lead them to his gorilla family because he is worried that Kerchak will hurt them. The time comes for the explorers to leave, and Clayton is desperate to capture the gorillas and put them on display in England, so he convinces Tarzan that Jane will stay with him if Tarzan just shows him where the gorillas live. Tarzan falls for it and takes them there, but Kerchak tries to attack the Clayton and the others. 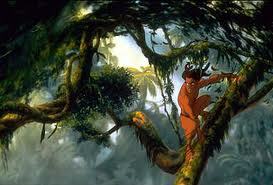 Tarzan intervenes so the people can escape, and then Kala takes him to the old treehouse and shows him his past. 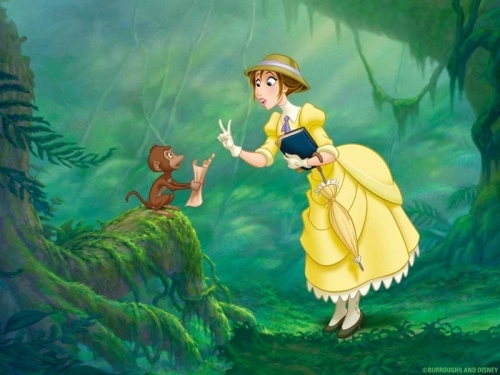 She convinces Tarzan to leave with Jane and the Professor, but when he goes back to the English, Clayton leads a troop of pirates to capture them and locks them up in the ship. Tarzan frees himself and goes to get Kerchak, who returns with Tarzan to take care of Clayton. 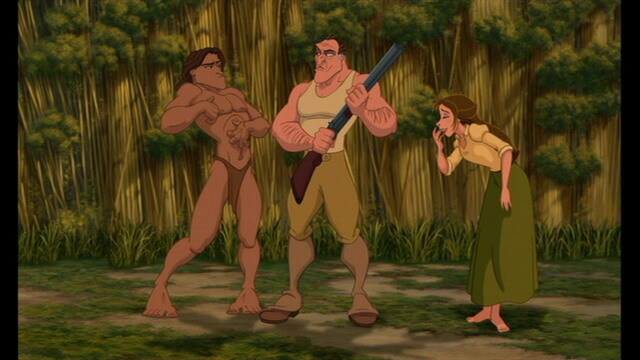 The guide, though, shoots Kerchak and chases Tarzan into the jungle. They have an epic fight among the vines of the towering trees, and when it is over, the dying Kerchak names Tarzan leader of his gorilla family. Jane must then decide if she wishes to return to England with her father or stay in Africa with the man she loves. For a Disney movie at the peak of the Disney Renaissance, the voice cast of "Tarzan" is fairly low-key. While "Aladdin" had begun a very successful trend of hiring a high-profile Hollywood star to voice a key supporting player (Robin Williams as the Genie), a tactic most recently employed in "Hercules" with James Woods voicing Hades, "Tarzan" did not have anybody like that in the voice cast. Tony Goldwyn (younger brother of Paramount Studios President John Goldwyn) was cast as Tarzan in an odd move, but since Tarzan doesn't really say much anyway, the choice works just fine. The key role in Disney movies, of course, is the villain, and the part of Clayton went to Brian Blessed because of Blessed's deep voice and ability to do the Tarzan yell for Goldwyn. Minnie Driver, at that time a rising young actress because of hits including "Good Will Hunting," voices Jane with a lot of ad libs, and Glenn Close is appropriately maternal as Kala. Lance Henriksen as Kerchak and Nigel Hawthorne as Professor Porter round out the leads, with Rosie O'Donnell cast in the usual animated Disney movie comic-relief role as Terk, a wisecracking (what else) friend of Tarzan. While several of these actors might be considered "A List," at least at the time, there is nobody who really takes over and dominates the film like a Robin Williams or a James Woods, and that is what a routine adaptation of a hackneyed story really needs to light it on fire. The studio apparently thought that the famous title alone would be enough to sell this movie, about which they were absolutely correct, but then one wonders where the huge budget went. Jane is a bit of a looker, eh? The answer apparently was the film's real draw, its cutting edge animation. There are sweeping 3D backgrounds which were created using a new painting and rendering technique know as Deep Canvas, a true breakthrough in the animation field which led to an Academy "Achievement" award. The software was used in subsequent films, but the rest of the industry was hot on Disney's heels and technical breakthroughs were coming fast and furious with the development of more powerful computers and advanced software. Make no mistake, "Tarzan" is a high-quality production that tells the Tarzan story about as faithfully as it could be told. It won the Academy Award and Golden Globe Award for Best song, "You'll Be In My Heart" by Phil Collins. Collins supplied a number of other quality songs such as "Son of Man" and "Two Worlds," singing most of them himself, giving "Tarzan" a distinct, unified sound. Giving the film a contemporary pop feel was a nice break from the sometimes depressing classical sounds of films like "The Hunchback of Notre Dame," though fans of Alan Menken might disagree. Collins' songs help pull the story forward rather than halt it in its tracks with show-stoppers, which nicely complements the fluid story and animation. The pop sound of Collins' songs, though, do jar a bit with the conventional background music by Mark Mancina. Several of the Collins songs sound very reminiscent of his '80s hits. If there is a fault to "Tarzan," it is that it is a little too smooth and polished. The entire backstory is compressed into a brilliant ten minutes at the start, just like in "The Lion King," and you have the standard musical interludes which were a hallmark of Disney movies in the 1990s and became increasingly rare in the 2000s. There is the inevitable comic sidekick (Jason Alexander did that to perfection in "Hunchback of Notre Dame), and that is about it for the comedy, another stylistic flourish of the Disney Renaissance. Later films would increase the comedy, probably to compete with the likes of competing franchises like DreamWorks' mega-successful "Shrek" series, but here it is restrained (though Rosie O'Donnell is usually not called that). There also are quiet, emotional moments, not something you find much of in later films. Disney movies moved away from this very successful formula after this, and no doubt did that for a very good reason. How you feel about "Tarzan" likely will depend on whether you prefer the Disney movie classics like "Beauty and the Beast," which have a Broadway air to them, or the more recent series such as the "Ice Age" line of films, which are fast-paced, jokey, full of comic characters invariably doing funny things, full of sly topical references, and with serious reflection present but confined to small, discrete plot points. "Tarzan" definitely falls in the former camp. "Tarzan" was released to home video in 2000, both in a single DVD version and a two-disc Collector's Edition," with another single-disc version released in 2005. 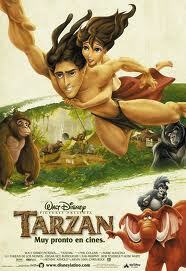 There were two direct to video sequels, "Tarzan & Jane" (2002) and prequel "Tarzan II" (2005). There is a Blu-ray edition that came out in Europe in 2012, but it may be difficult to find. Everybody knows the basic story of Edgar Rice Burroughs' Tarzan. This Disney movie "Tarzan" is the only animated version, and it is extremely well done, true to the story, and is much loved. If you want to spend some quality time in the jungle with someone familiar and fun, pop "Tarzan" in the player and enjoy. Below is the original trailer for "Tarzan."